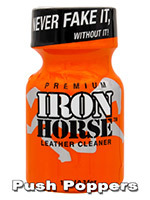 Enjoy the brand new bottle by Iron Horse, a special EU fragrance that will give you wild raw animal power! The Iron Horse Poppers are particularly loved in saunas and clubs, where you can open up to anybody and have an amazing time! The strong aroma can turn you into an unstoppable Iron Horse thanks to its arousing and lustful scent, which can turn anybody into a powerful beast.